You can reach the office by calling: 905-622-9115 or by e-mailing info@detaeyedesigns.ca. De Taeye Designs Waterproofing Division has specialized for over 15 years in basement waterproofing and foundation repairs. Shawn De Taeye was trained in the family business of waterproofing at a young age with his father, which he was sub-contracting in for many years. This experience sparked an interest in residential renovations and led him to get certified as a licensed carpenter. Raised under the philosophy of providing quality service at reasonable rates by his father, De Taeye Designs helps you to dream, create, build, and live. Locally owned and operated, De Taeye Designs will solve all your basement waterproofing, foundation repair and crawl space issues. Each of our products includes a written, transferrable lifetime warranty. De Taeye Designs provides basement waterproofing solutions for the residential home owner, commercial business owner, low-rise and high-rise buildings and for the construction industry. The team at De Taeye Designs have experience fixing cracked basement walls and providing basement waterproofing solutions, including both indoor and outdoor waterproofing systems, for the Durham Region and surrounding areas. De Taeye Designs waterproofing solutions has grown to be the service leaders for the area. Shawn is a member of Renomark, Durham Region Homebuilders Association and holds various other accreditations in the respective fields they serve. Check out the Homestars reviews at: https://homestars.com/companies/2813600-de-taeye-designs. Cracks in foundations can cause serious damage. Water damage can be a serious issue in a home and can cause extensive damage. It is important to repair cracks in order for more damage not to occur. Installation and repair of window wells. Window wells are an important part of your homes waterproofing system and it is important that they be functioning properly. 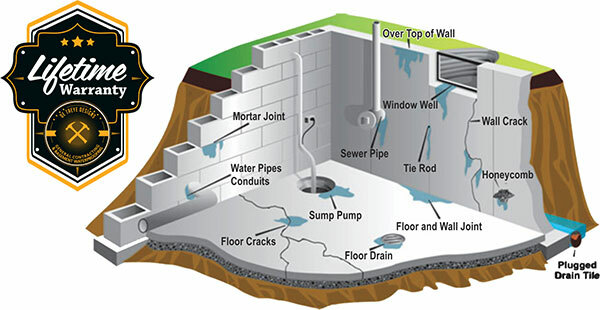 Repairs to foundations includes installation of interior and exterior waterproofing systems. Looking to get some renovation work done or do you have leak in your basement? We can Help!